Not wanting to suffer through the Labor Day weekend traffic, we stayed home and concentrated on being lazy. (We’re getting very good at it.) I did, however, spend a fair amount of time in the kitchen and came up with a few nice additions to the recipe box. I had a pound of cantaloupe sitting in the refrigerator and it wasn’t going to last too much longer. What better way to use up fruit than to make a sorbet? Never having made sorbet before, I did a little research online and saw that pretty much anything goes…fruit, some liquid, some sweetness, additional flavors if you want them, turn on the ice cream maker, and you’re done. And the good news: it is so much less work than making ice cream. No stirring custard or tempering eggs! I wanted to do just a little something to jazz up my sorbet. Doesn’t vodka go with everything??? Puree all ingredients in a blender (making sure that the sugar is completely dissolved). Pour mixture into ice cream maker and let the machine do the rest. (I have a Cuisinart ice cream maker and ran it for about 30-40 minutes, but time can vary depending on the machine). Transfer the sorbet to the freezer to finish setting up, a few hours at least. My favorite part of this sorbet is the texture. It manages to be creamy without a single drop of cream. The hint of lemon sets off the cantaloupe flavor quite nicely, and the refreshing lightness of the sorbet doesn’t leave you with that overly full feeling. It’s the perfect ending to a meal. You get a lot of bang for your buck with this one. No one will ever guess that the time you spent in the kitchen was about 5 minutes. I love the bright colour of the sorbet. Looks delicious! Hmmmm...I dug out my Cuisinart ice cream maker to make gelato yesterday. Think I might need to make this next Sunday while cantaloupes are on sale. No lemon vodka on hand, though...think port could work? Looks yummy! We avoided the crowds today and just grilled Salmon! Mmmnm.... This sorbet looks really tempting! And that lemon vodka.... oh my. Btw, I love all the recipes featured on your blog. Are you pulling our leg about not being professionally trained and not looking at any cookbooks?? LOL. If so, I'm mighty envious! A spiked sorbet? That sounds right up my alley - I really like the addition of the lemon juice along with the lemon vodka. Limocello would also be nice too . . .
Love the spiked sorbet! Vodka makes a perfect pairing - and I also love the other suggestions of champagne and limoncello :) Perfect for this warm weather we've been enjoying! @Foodiva - Thanks for the nice comment...and nope, not pulling your leg. I wish I was professionally trained! 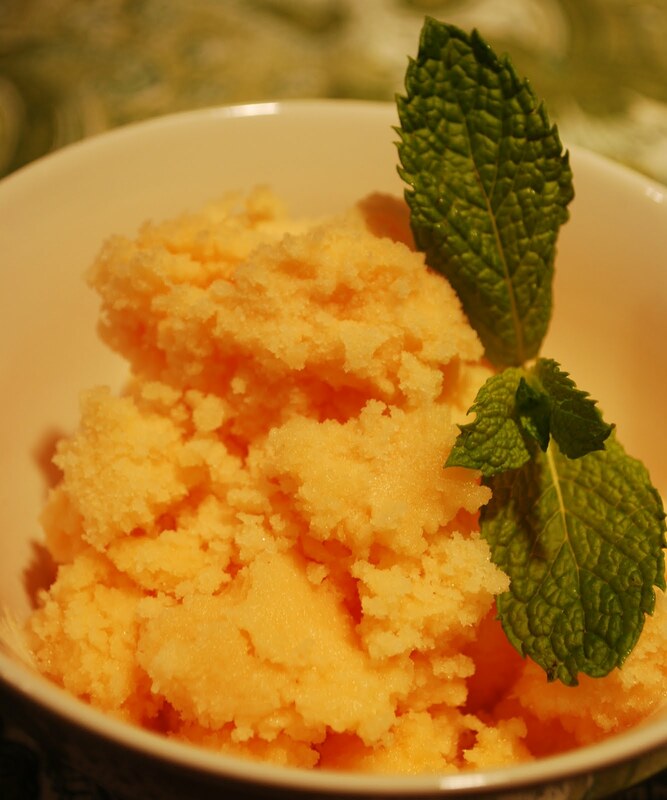 Must try the this yummy cantaloupe sorbet. Looks and tastes, I'm sure just like fresh frozen cantaloupe. I don't know how I missed this one. I love cantaloupe sorbet. It's just so smooth and refreshing. I'm going to miss them until next year. It won't be long before we'll be embracing the flavors of autumn.